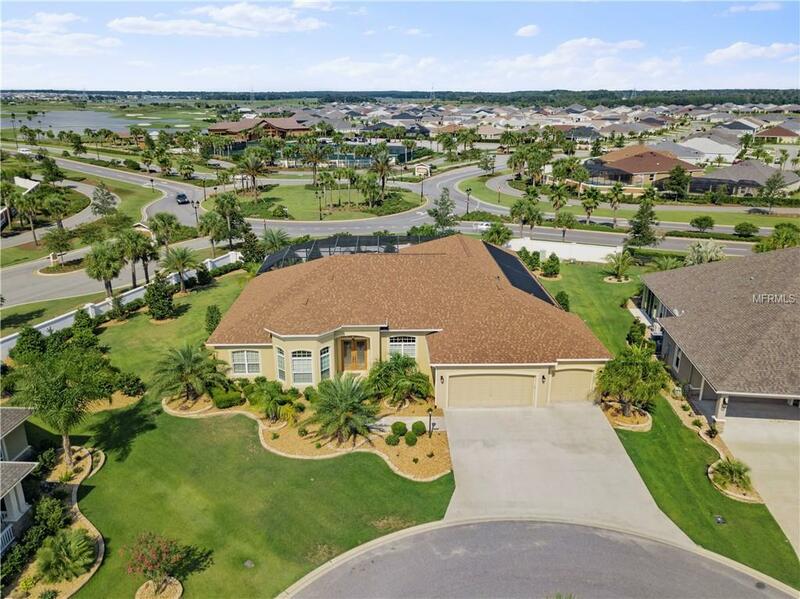 PREMIER GRANDVIEW - VILLAGE OF OSCEOLA HILLS AT SOARING EAGLE LAKE DEATON. JUST A QUICK WALK TO BURNSED RECREATION CENTER AND SHORT BIKE RIDE TO ROHAN RECREATION WITH SHOPPING AND BANKING NEARBY. NO REAR NEIGHBORS! SUMTER COUNTY LOCATION! 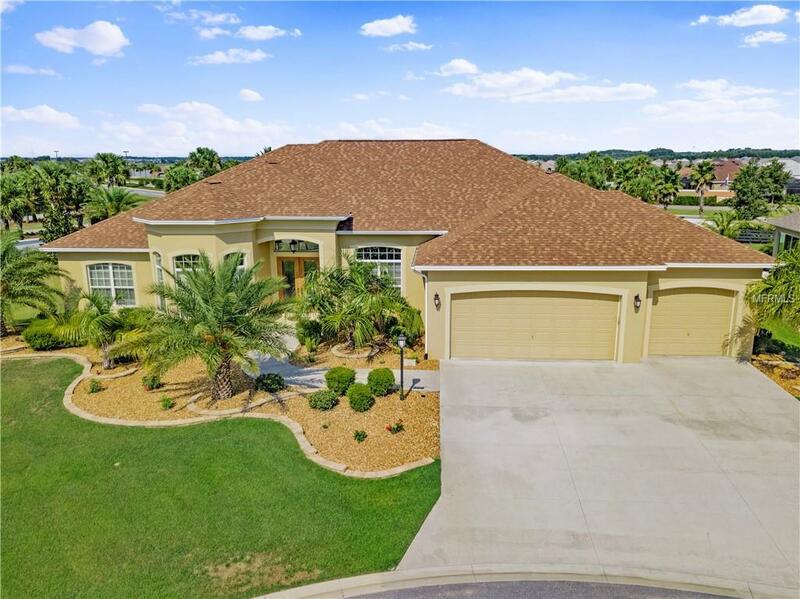 This lovely home has 3629 sq ft, 4 bedrooms, 3 full bathrooms, 3-CAR GARAGE, BEAUTIFUL POOL /4 FIRE BOWLS, waterfall, & 6 water spouts, 12 SOLAR PANELS Inside this LOVELY OPEN FLOORPLAN home you will find beautiful tiled floors in the living and dining room, hallways, 4th bedroom, dinette area, kitchen, family and laundry room. CROWN MOLDING ACCENTS WITH ARCHITECURAL NICHES AND ARCHWAYS, BUTLER PANTRY WITH WET BAR, WINE COOLER, GRANITE. Double doors lead to the 4th bedroom which is being used as office. 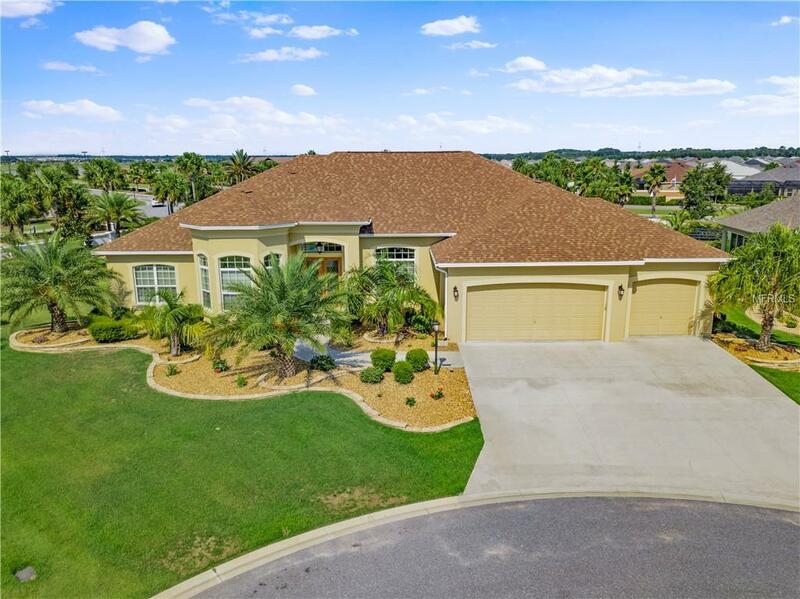 LARGE OPEN KITCHEN with GRANITE counter-tops, cherry stair-step-cabinets, walk-in pantry, center island, pull out drawers, stainless steel appliances. Dinette area has nice views of your large enclosed area with TWO LANAIS. FAMILY ROOM has two sets of sliders to access pool. MASTER SUITE IS LARGE WITH room for sitting area with sliders to pool. En-suite bath with separate granite vanities, two walk-in closets, separate water closet, large tiled walk-in shower, linen closet. OPEN BACKYARD WALLED FOR PRIVACY, full pool bath and SUMMER KITCHEN w/200 gal gas tank for the grill and fire bowls! AREA IS LOVELY WITH RECREATIONAL TRAILS THAT ARE LESS CROWDED AND CONSERVATIONS AREAS AROUND MAKES FOR A LOVELY NEIGHBORHOOD.